If you want to spread the cost without upfront or monthly repayments then the new Buy Now Pay Later option from both Ace and the Studio pay monthly catalogue could be for you. This new payment option allows you to place orders for a set period of time when no payments or interest will be applied. As long as you clear the entire balance before the Buy Now Pay Later period ends you will pay no interest. If you don't clear the entire balance in full before the Buy now Pay later period expires you will be charged interest. This interest will be backdated to the time of your order and will increase the amount you owe. Currently, Buy Now Pay Later is only available on selected items and to selected customers. To see if you are eligible for buy now pay later, login to your account and read about the New buy now pay later options. Both Studio and Ace customers can take advantage of new options when placing orders. Buy Now Pay later has once again become very popular. The idea means you can place orders without any upfront payments and without the need to make a minimum repayment for a period (of usually up to 12 months). There will be no interest added providing you do clear the entire balance before the buy now pay later period ends. Ace Catalogue now offer various options to it's customers, so when placing orders be sure to understand what option you choose. You can now pay using a debit or credit card, add to your account as normal, use the new buy now pay later or even take advantage of Interest Saver. 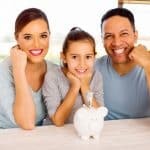 Just be sure to clear the entire balance before the buy now pay later period ends as deferred interest can make the debt a lot more expensive. If the Buy now pay later period ends and you have cleared the entire order total no interest will be added. If however, the buy now pay later period ends and there is still an outstanding balance, the total interest of the order back dated until the date you placed the order will be applied. This will be added to your account and normal monthly repayments will become due. 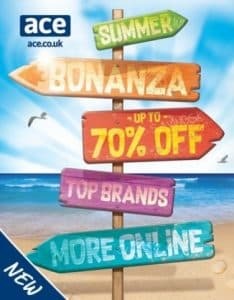 For full details of the Ace Buy now pay later option and it's full terms and eligibility please check the Ace.co.uk website.